A very very simple recipe. One of my favourite way to stir fry vegetable. Must use white fermented curd; with chilli and/or sesame oil or just plain. Don't buy any that looks green or gray, they are disgustingly smelly. Red bean curd is different and I only use it for braising meat. The picture above shows two different brands of white fermented bean curds with chilli and sesame oil. 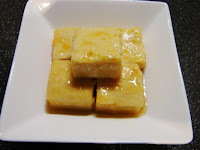 Also included a tiny picture of few cubes of white bean curd below. The fermented bean curd sauce is creamy and the spinach is tender and smooth. The spinach will wilt and cook down to very little. 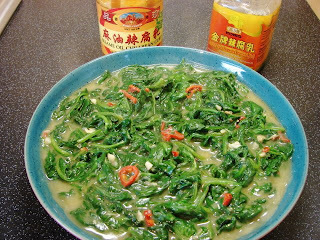 Other than spinach I also cooked water spinach or Kangkong the same way. Heat oil in wok, add garlic and chilli, stir fry till fragrant. Add fermented bean curds, smashed to a paste with the stirrer. Add spinach, in several batches, push wilted leaves aside and stir in unwilted ones till all wilted. Add some sugar to taste. If not salty enough add a little soy to taste. Add slackened cornflour, thickened and ready to eat. Oh yum, I'll definitely be making this as soon as I get my hands on some white fermented beancurd. I only have red. If and when I got the ingredients I will make it and post a picture on the blog. Thank you very much for your recipe. It sure looks like the one I've been looking for. Now to get ambitious, gather up the ingredients and try to make it. Also, thanks. Now I know about the BBC message board. Do join our friendly board for a chat. See you there.